Lake level at press time is 5.2 feet, almost a foot and a half higher than February began. Water clarity moves around the lake with the better areas having around 3 feet of clarity and a greenish tint to areas with 1 ½ feet of visibility and a brownish tint. Most of the incoming creeks are back to throwing some stain to the water as today it not only rained, it snowed on the surrounding hilltops. Water temps are holding between 48 and 50 degrees on most of the upper end and lower end as well. There have been many gorgeous days this past month when the catching part has been somewhat slow, but when sunny, warm days hit in March, watch out, fish will be moving up! March is a month held hostage by the seasonal storm patterns. The tough side is the rough storms moving through that can create virtually unfishable conditions due to wind related wave action. The bright side of the month is that not only do a large number of bass begin to move towards the shallows, some really large fish begin that move as well. Looking back, most of the best days I have shared with clients for larger fish have been in March. Whether it is sitting on prespawn staging areas with live bait, by far the most productive method this month, or tossing swim baits, this is the month to make it happen. Another effective technique this month is ripping. This can be an extremely good time to learn confidence in this presentation and while learning catch a couple of dozen fish in the process. It is a technique that works on all bodies of water expecially in the mid 40 to mid 50 degree water temperature range. Last year I found a great bite on plastic worms, which really surprised me. It wasn’t a surprise that we could catch fish on them…I was thrilled to see the size fish that particular rig was catching. Look for an offer later in the newsletter that will get you on the water with a buddy and save you some money as well! The basics on one of my big fish secrets of last March. If you have been following national tournament activity over the past several years you have heard of the shakey head. A number of the new hot sticks have been extremely successful with it all the way to Kevin Van Dam’s eleven plus pounder that set a lake record during an offical B.A.S.S. event. I won two tournaments last March using it and had three 25 pound+ limits during tournament action including a 30 pound limit that was anchored by a 10 plus and another 10 plus in a 26 pound limit. Last week, Jim and I caught another 26 pound limit on it. When I talk about shaking a worm it could be on a drop shot rig, a brass and glass set up, a dart head, or a shakey head. The key in this set up, especially for the larger fish it seems to catch is the package. I have been using the “Screwed Up Jig Head” made by Reaction Innovations. It’s design is simple, an old fashioned ball head jig with a great hook that has the eye turned the same as a worm hook and tilted up about 60 degrees and the final touch is a small spring that sticks out of the back of the ball head. While they come in a number of weights, here I have used the 1/8 and 3/16 oz size the most. To rig the worm you simply screw it onto the spring and then bury the hook into the body of the worm creating a set up that will come though just about anything. My favorite worm for this set up is the 6 inch Trick Worm by Zoom Plastics. Dark colors and natural colors seem to work the best though my favorites are Junebug and Watermelon Candy. This worm is tough and you don’t go through very many of them, even on a great day. The most effective presentation is a constant and not so subtle shake of the rod tip from the time the worm hits the water to the time you reel in for the next cast. There are two keys to why this bait works: first it remains on the bottom with the jig flipping the tail of the worm up off the bottom and secondly, the tail of the trick worm has extra bulk on it that I think triggers the bigger bite. Most bites feel like the worm is just getting heavier or harder to shake. The more aggressive bites are hard taps and then the bait is swimming off. Either way, using this presentation you will see as many bites as you will feel. You really need to add this weapon to your arsenal of tactics. These specialty baits are fast becoming a year round lure choice. Simply by changing the size of the bait you can show the fish something a little different. Many anglers have made a token effort to try swim baiting and met with frustration and then gave it up. What a mistake! I have found the biggest mistake with swim baits is not using them more often. Most of us hear the word swim bait, and immediately jump to the giant trout looking baits made famous in Southern California. My first swim bait experience was with an AC Plug made famous by striper fishermen. I bought one and with no other knowledge, headed off to lake McClure without a clue to what I was supposed to do with it. The results were not surprising, one day of using my new secret weapon, no bites, no lookers, and never to be thrown again. Needless to say, I am past that now though it did take almost nine years to pick one up again. If I only had one to use, it would be the Mission Fish paddle tail in 5 inch. If I am allowed two then I will add the River2Sea Live Bottom Walker Shad 150 size. If I get to have 3, then I will add the River2Sea Live Bottom Walker Shad in the 120 size. 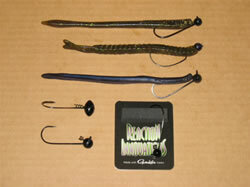 These 3 baits will catch fish year round and they will catch largemouth, spotted bass, and smallmouth bass. Of the three I mentioned, I have caught larger fish on the LBWS 150, several over 10 including an 11 ½. The hardest part about using these baits is gaining confidence that you will catch fish on them. 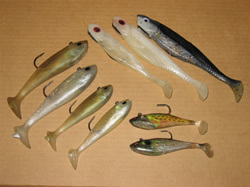 The two smaller sized baits will not only catch good fish, they will also catch good numbers of average size fish too. It is fairly common with the smaller sized baits to catch 2 to 3 pound fish in between the 5 pound fish. The larger LBWS 150 does not catch as many of the smaller fish, it’s appears attractive to the 4 pound plus group of bass, a nice group to get to know. I can’t really take the time and space here to lay it out for you completely and confidence comes in the catching so come out and experience the thrill of this big fish presentation. Remember, it does not work just here. Not everyone gets to fish as often as I do (sorry), now is the time to look at the line on your favorite reels. Pros will change their line daily during a tournament. I will usually get two years out of braid, 6 months out of fluorocarbon, and a month out of monofilament. When you think about it, and compare the prices, braid isn’t as expensive as it first appears. You can follow these same guidelines if you fish as often as I do. If you don’t fish as often, keep in mind that one of monofilament’s most annoying characteristics is memory. Memory is what causes mono that has been stored on the reel for an extended period of time to come off in coils and misbehave. Flourocarbon has a memory but it is wants to stretch out and lay flat. If you have not used a reel in a while, consider using one of the line dressings available like Tangle Free, Kevin Van Dam’s Line Conditioner, or even Reel Magic. All of these products will lubricate the line making it more manageable until it soaks up water through use. Also consider stretching mono by tying off one end to a firm anchor point, walk off a good long cast, then pull tight as if fighting a fish and hold the tension for 15 seconds. This will take the coil set out of most monofilaments enough for you to start fishing and not notice it again. Finally, in comparison to the value of your fishing time, the line on your favorite reel is the least expensive part of your tool box, change it. Powell has two new rods specifically designed for throwing swim baits and a third that will work real well for the mid to small size versions. The two big guns are the 7’11” Heavy #711SBRH and Medium Heavy #711SBRMH. The third new rod is an addition to the crankbait series and is the 7’ 6” #765CB. If you are looking to throw the super baits like the Huddleston Deluxe, large MS Slammers, or 7” Rago generic trouts, the heavy action is for you. This rod has 9 guides and the tip, weighs in at 6.88 ounces and is rated for lure weights of 5 to 8 ounces with a moderate fast tip. It is a stout rod with plenty of power to heave these monsters a long distance, accurately. And speaking of heaving monsters…I doubt you will have a problem bouncing a 7 pounder with this serious tool! Not into the big guns? Check out the Medium Heavy version. It has a softer tip, weighs in at 6.5 ounces and is rated for lure weights of 3 to 5 ounces. It also sports 9 guides and the tip. The power curve on this rod is designed to give you an extra fast tip to control medium sized swim baits with accuracy and yet the backbone in this rod is exceptional. Both of these rods have been specifically designed for swim bait fishing with input and feedback from several of the best current swim bait fishermen around. Want to use swimbaits without the heavy feel of most rods designed for the task and you don’t see yourself as a long term hud pitcher? Check out the new addition to the crankbait series, the 765CB . This rod will handle the year round versatility of a wide variety of the smaller baits such as the 4” River2 Sea, 5” and 6” Mission Fish, and small MS Slammers. It is rated for lure weights of ¼ to 1 ounce. The action on this rod is softer, a moderate fast allowing the fish to really attack and take a bait. The other noticeable difference is in the weight of the rod itself at 4.68 ounces. It also carries 9 guides and a tip. All three of these models fall into the $199 price range which is a great value for a rod that performs as well as rods that sell for twice the price. Check them out if you are serious about making swim baits a bigger part of your arsenal. Also, take a look at Powell’s new web site, lots of new information. Powellco.com. Here is a way for you to enjoy some of the outstanding fishing March has to offer, avoid the crowds, and save some money. Book a full day trip for two on a Tuesday or Wednesday in the month of March and pay the single angler price, a savings of $100! The trip must be booked by March 5th for this great savings so don’t delay. If you have not spent much time on clearlakeguideservice.com, check it out. There is a lot of useful information available. 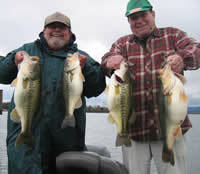 Even insights into the best times to fish the lake and other fishing tips. Local lodging, weather, and even lake level reporting is available through the links we have set up. Need something we don’t have displayed? Let me know and I will consider adding it. We have also made changes to our rate page effective January 2007. Good fishing and I look forward to seeing you soon!